Go Bitless and Feel Secure! 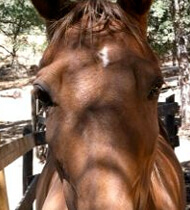 I Love My LG Bridle and so do 5 of my Horses! It is totally a personal preference if you wish to use a bitless bridle. So, I’m not writing this to convince anyone to go bitless. 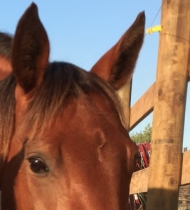 I’m writing this because I finally found a bitless bridle that gives me as much control as possible, a nice headset and is comfortable for my horse. WHAT IS IT? I know it looks odd, sort-of like a wheel. Let me tell you, it works beautifully! 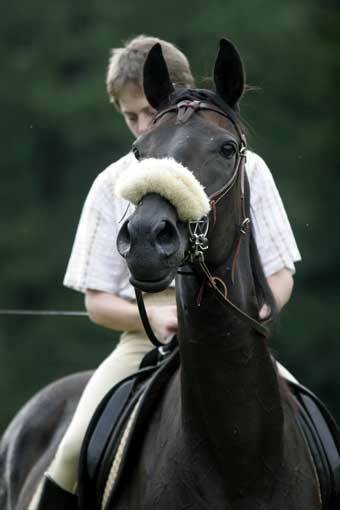 The LG Bridle was invented by a German Dressage Rider. She needed or wanted a way to bridle her horse without a bit that would give her head set plus control and that could be sanctioned by the dressage community. This was her invention. I don’t remember how I found out about it, but I remember going to the website to check it out. 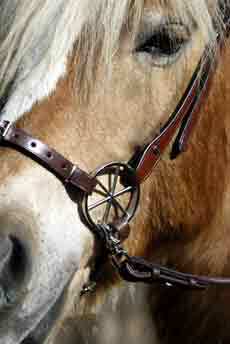 There are several videos there that show the bridle in action. Impressive. You see jumpers and dressage riders as well as trail riders using the bridle. 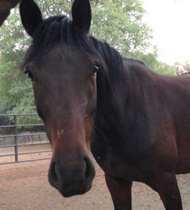 HERE IS HOW IT WORKS… You use your own headstall. What you are buying are the two wheels and the nose/chin straps. 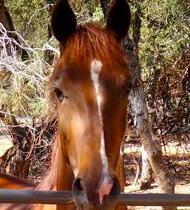 You fit it to your horse according to how they hold their heads and move. So, the spokes are levels of control, let’s say. You connect the top of the wheel to the headstall, the inside of the wheel to the nose band, the back of the wheel to the chin strap and then the adjustable part is where you attach your rein. The closer to the chin strap, the less severe of a pull on the poll and nose. You can set it to be more like a side-pull or to work like a rein that encourage a head set. When you lift your rein, the contact lowers the poll and pulls the nose to whatever degree you have it set. Does that make sense? THE DIFFERENCE here than with other bitless bridles (and I’ve tried them all) is that you have no crossed or single reins that go through a ring(s) that then need to release once the horse gives. Most all other bitless bridles don’t release immediately. 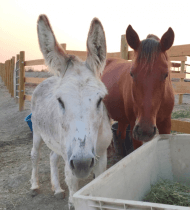 My horses were frustrated with other bitless bridles because they either didn’t release, got hung up, or pulled too hard on the poll – or for me, were too ineffectual for the head set. I BOUGHT THIS BRIDLE BECAUSE it sounded right from the website. I could see how it would work. Truth to tell, it took me a few tries to get it adjusted correctly. 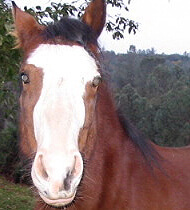 But, once I did , my Morgan mare was a DREAM. I swear, she was so happy! Granted, this mare was trained to a bit or a hackamore, so one could say that she was already comfortable with a hackamore style so that is why she took to this bridle. Read on for my answer to that. I TRIED IT ON 5 HORSES AND HERE ARE MY RESULTS: OK, well, in the paragraph above, I described how my Morgan mare who has a lot of “go!” loved it! So now I was ready to try it on my other horses. I put it on my Tennessee Walking mare. She had just 90 days training and that was in a bit. But, she hated the bit – any bit. I had tried them all. Poor girl just fought with it and threw her head a lot. You could argue that maybe I have bad hands. But, her trainer also had the same issue with every bit she tried. 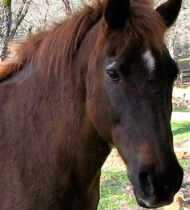 Anyway, I was a little nervous to put the LG on my TWH mare because she was young and green. But, I did. And, the mare loved it! She was so responsive because she wasn’t so worried all the time. And, she heard me! She was listening. It was so easy. Her arena work was great! Here is another photo from the LG Bridle website. After that experience, I tried it on my TWH gelding. 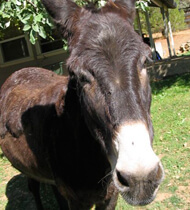 He is older and used to a bit or a hackamore. Although well trained, he has some zip to him, if you know what I mean. I don’t do arena work with him, I only trail ride him. So, I had to be brave. I put the LG on his headstall and adjusted it. We trailered to a his well-known riding spot. I figured I would be safer in a spot we both knew. Then, I mounted and left as usual. I tried to act like he was wearing his regular tack. Well, honestly, he was better than he had ever been and gaited more smoothly. I thought maybe that was a fluke. So, I tried it again the next day. Perfect. Wonderful. So, I tried again and brought along a horse that usually riles him up. Yup, we had a little antsy pansty session but the bridle held up and I felt as if I had the same control as with a hackamore or a bit. In fact, I felt like I had more control because he couldn’t grab on and run. I put it on my Mustang with the same results. STARTING A HORSE IN AN LG BRIDLE? 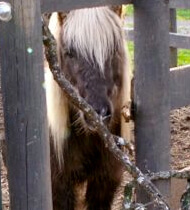 I called the company and asked if they had ever started a horse with one. The rep said, Yes! So, I started my Icelandic filly in the LG Bridle. So far, so good. She responds just as she should and she has never thrown her head or chewed on the bit (of course). I see no issues with this bridle. I will say that several trainers have told me that I should not start a horse in the LG. They believe that I need to train in a snaffle to get the general idea down first and then switch to the LG once she is trained. I don’t know if they are right or wrong… but so far, I see no reason to snaffle train her. She is doing just fine. And, she is the strongest minded of the bunch. I DON’T USE BITS ANYMORE… So, that is my story. I now have five of the LG Bridles for all five of my riding horses. I have archived all of my bits. I don’t use a bit ever anymore. I figure if a dressage rider can get the head set she needs and a jumper can control his horse, I am just fine with this bridle as a trail rider. I love it. I love all 5 of them. 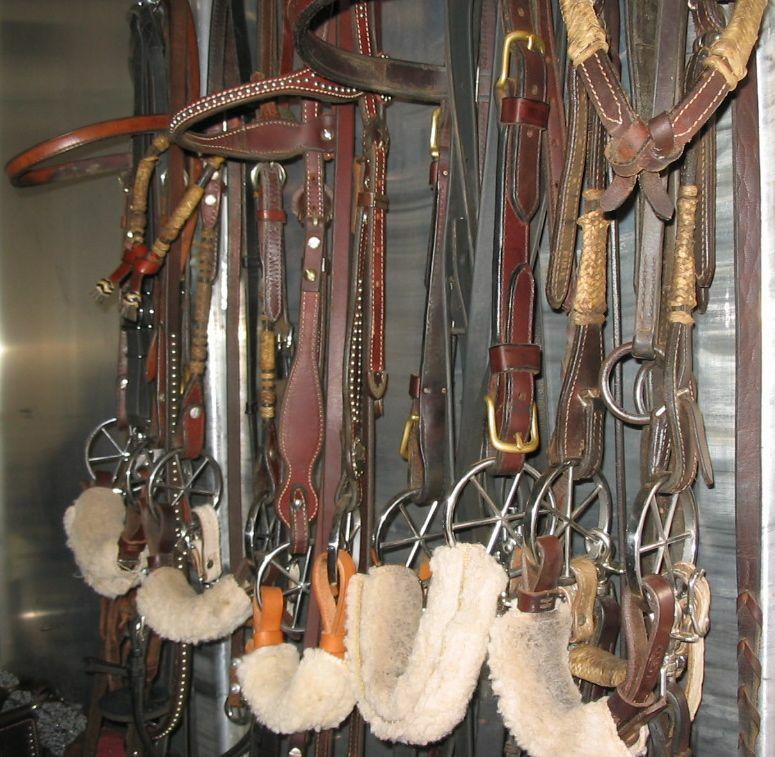 Here is a picture of my bridle rack in my trailer. As you can see, I use all different headstalls for 4 different breeds of horses, gaited and trotting. PROS & CONS: The LG is “expensive”. I say that in quotes because it is an investment but it works and is solid so I didn’t mind. 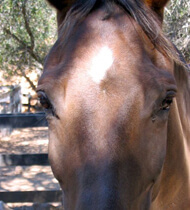 All of the nose bands and chin straps that I got from the company were too big for my smaller, American horses. I think these bridles were developed in a land where the horses are HUGE. Dunno. But, I ended up just using the wheels, the nose bands on their smallest rung and my own chin straps. 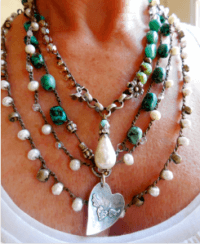 I do use a chain on some and leather or rawhide on others. I also wrapped all the nose bands in fleece, as you can see. LET ME KNOW if you test one or purchase one. I love mine! And again, I have no affiliation with LG. I just am really happy and want to spread the word! Horse Bling for Valentine’s Day! 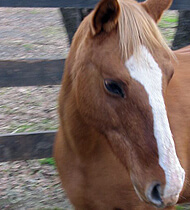 I am interested in a LG bridle. Are you still taking orders? If not is there any other place I can get one? 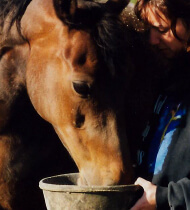 Great article, only just found it while researching bitless bridles. Does any one know how well this bridle works for jumping? 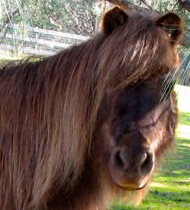 I don’t like bits my pony doesn’t seem to mind but it’s time to change. Also, he thinks that he’s a TB when we go trekking and races with my sisters TB at full gallop and ignores me, is this bridle good for stopping strong horses? I am interested in getting a LG bitless briddle. Does it come with instructions? And where do I place my order? Anxiously awaiting your swift reply. Have had a couple LG bridles for years now. One thing I do right with horses is to teach them REAL collection….total engagement of the hind quarters, elevation of the wither, elevation of the neck, and most elegant and soft giving head set imaginable. The LG is a very real and respectable tool for this. When used properly, gingerly, and with very educated hands, it will never act on the poll and chin together. Is possible to use it very, very finely, establish a fine collection, and have the horse utterly set up for anything you’d ask… but yet light as a feather with only the weight of a slightly draping rein as support. Have had many “AH HA!” moments… many enlightenments using the LG. When comparing shots or videos, I don’t see any real difference in using the LG or a bit on my own horses. If anything my horses look MUCH lighter in front than the “collected” horses I see in less than practiced hands. Not being arrogant here, but there is a tremendous difference between “containment” which I often see resulting in a lack of impulsion and faulting the front end….and real collection which frees the front end while the hind end steps under fiercely. Think canter pirouettes. 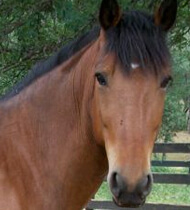 Have worked with all kinds of horses both tough and over achiever types in the LG. My personal horse is an off-track 17.1 hh TB that I retrained as a BigEq champion…he goes in the LG frequently for more intensive dressage work, to introduce new higher level dressage movements, and for general hacking. I feel very safe using the LG. I feel the thread of connection is very strong yet gentle. I swear by it and my horse’s are the proof positive. Would imagine the LG to be an excellent tool for teaching or re-educating someone’s hands….to make them softer, more forgiving, and more exact……to make the “static” of unsure hands and the weight of heavy hands a thing of the past. Worth far more than the actual price in terms of value. Would never part with mine. My horse took to this RIGHT away and i cannot believe the collection you can achieve, a nice soft ‘whoa’…and backing and turning/bending is perfect!!! This to me is ‘THE’ Bitless device i have been looking for! 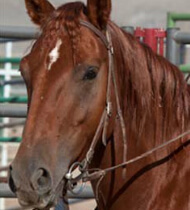 I was using a Lindell and also sometimes just a rope halter….. But i feel this will help me achieve a bit more collection to a horse that will be learning this summer to use his back and hind end more….for gaiting. Perfect! I sold 2 on the trail to my friends as well. THEY were very impressed. SO….now we need a rep. Enjoy your vacation! Really, stop writing and ENJOY it, before you know it you’ll be back to the daily grind! This is a wonderful and very informative site, be sure to check out the other articles. Thank you! Music to my ears! I want to thank the blogger very much not only for this post but also for his all previous efforts. 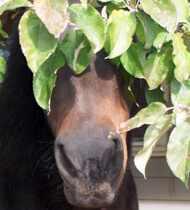 I found horseandman.com to be greatly interesting. I will be coming back to horseandman.com for more information. I’m from Sweden and I’m waiting for my first LG bridle now! Can’t wait! I hope I will love my LG as much as you love yours! you as I’m not an expert. I can only say that if your horse has a whoa, the LG would work great!